Founded in 2007, Smith-Stewart specializes in finding and cultivating new talent while producing a dynamic roster of exhibitions that spans mediums, expands aesthetic convention, and reaches across generations. In its two-years of operating on Stanton Street in the Lower East Side of NYC, the gallery appeared regularly in international magazines and newspapers and exhibitions were frequently reviewed in such notable publications as ArtForum, The New York Times and The New Yorker. Smith-Stewart recently evolved into a roving curatorial project with no permanent address. Recent interview with Meredith Mendelsohn for Archteypeme.com. Artists: Natalie Jeremijenko and xClinic, Mary Miss, Rirkrit Tiravanija, and George Trakas. Performaces by: Shoplifter, Lisa Kirk, Kenya (Robinson), Katie Cercone & The Push Pops & Shana Moulton on opening night. SVA Visual Arts Gallery, 601 W26th St., 15th Floor, NYC. Fay Ray: The Third Mind, Pink and gold Field, an Installation @ The Wooly, The Woolworth Building, 11 Barclay St., NY. Opened Thursday, March 3rd, 2011. "Policy, Painted or Set in Stone", by Martha SCHWENDENER, The New York Times, December 8, 2011. "Artists Reimagine Development in Long Island City", by Abbie Fentress Swanson, WNYC.org, October 12, 2011. "CIVIC ACTION: A Vision for Long Island City", by Sara Christoph, The Brooklyn Rail, November 2011. New York Photo Festival 2012 Brings Curators Into Focus", by Jacqueline Bischof, wsj.com, May 17, 2012. Critic's Pick review on artforum.com by Johanna Fateman. Opening reception featured on ArtnetTV. Selected for Artinfo.com's 12 NYC Picks. The Influentials is reviewed in Art Monthly & The New Yorker. The New York Times: "Subversive Artists Host a Party at the Wooly" by Cathy Che. Interview, Collector's Q & A, ExhibitionA.com, August 2012. 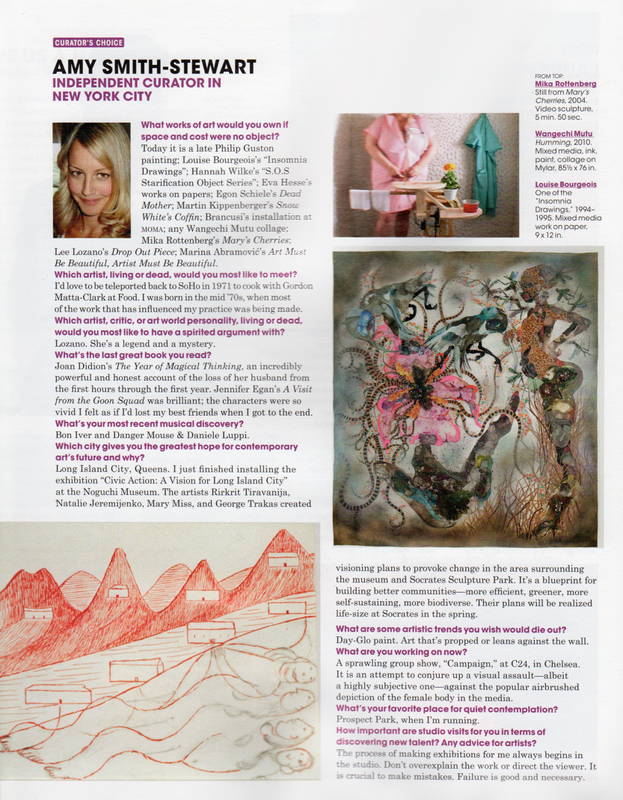 Curator's Choice, Interview in December 2011 Issue of Modern Painters. Carly Berwick in New York Magazine's Annual Fall Guide, 2011. Smith-Stewart is featured in The New York Times, "You Never Know Where Her Gallery Will Pop Up Next", by Alex Williams, May, 12, 2010. 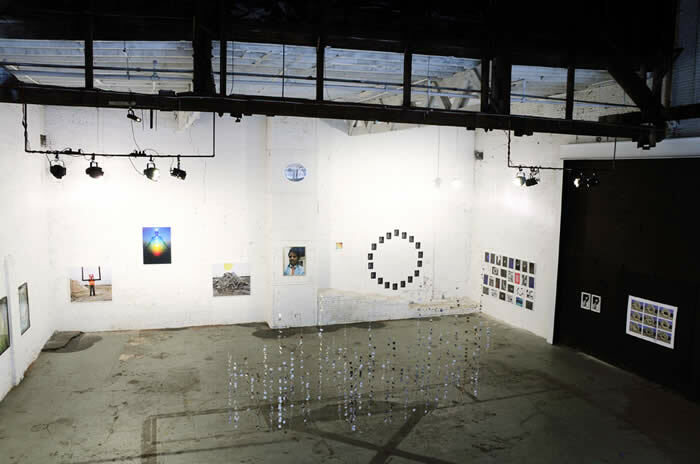 Installation view, "What Do You Believe In", May 16-31, 2012, Former carousel building, 56 Water Street, Brooklyn. Photo by Jacob Pastrovich, Courtesy of New York Photo Festival.